Thomas Steven Weatherford was born on the 17th December 1982, in Crown Point, Indiana USA. He is an American Football player playing in the role of punter for the New York Jets in the National Football League (NFL). Among a number of career highlights Weatherford holds the titles of Super Bowl Champion (XLVI) and NFC Champion (2011). Steve Weatherford has been active in the professional sport since 2006. How rich is the professional sportsman? It has been estimated that the outright size of Steve’s wealth is as much as $2 million, as of the data presented in mid-2016. To begin with, he was educated at Terre Haute North Vigo High School. There he played football, basketball, and soccer as well as competing on the track. He was very successful in all the sports earning more than 10 high school awards for excellence in school activities, and is the winner of All-State honours. As an athlete, he participated in the Junior Olympics. During his college career he played for the team of the University of Illinois. In 2003 he was named All Big Ten, a year later First-team All-Big Ten. Weatherford was not chosen in the NFL Draft 2006, however, he signed with the New Orleans Saints as a free agent. Steve played in all 16 games of the regular season with the above mentioned team, kicking 77 times at an average of 43.8 yards per attempt, finishing in 15th place in the league. Weatherford netted two tackles and ran 15 yards in gaining a first down. This season provided the base to his net worth. In 2008, the player was transferred from the Saints to the Kansas City Chiefs, but then signed with the Jacksonville Jaguars after Adam Podlesh had been placed on the injured list. Weatherford reached a contract agreement with the New York Jets in 2009, and became the punter of the team for the season. Yet Steve had to give up the first round of the play-offs for the Jets because of the problems with an irregular heartbeat. Weatherford explained that he had undergone surgery during the college period to correct a congenital heart defect that was straining his heart. Weatherford said he had undergone a medical examination to see if he would be able to play the next game and that he would undergo surgery again after this season to eliminate the problem, and in 2010, Weatherford successfully underwent that intervention. 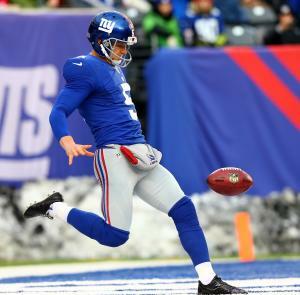 During the 2010 season, Weatherford drew the season’s record for the most punts within the 20-yard zone. Weatherford moved to the New York Giants in 2011, and recorded an average of 45.7 yards per point, and after the season signed a five-year contract with the Giants. Then in 2015, he signed a contract with New York Jets. According to the statistics, Steve has 678 punts, 30,159 punt yards, 44.5 punting yard average, the longest punt is 71. Finally, in the personal life of the professional football player, he is married to Laura, and the family has four children. They have two residences, one in California and another in New Jersey. Place Of Birth Crown Point, Indiana, U.S.